A long day’s effort rewards you with views stretching in all directions along the long, narrow summit of this granite behemoth. From the trailhead, keep left to the outlet of the lake. You may need to get your feet wet to cross over Tenaya Creek. Once across the creek, take a right and follow the creek downstream for a bit as it meanders through the forest. The trail leaves the creek and continues along a fairly level path through a changing mix of forest, rock formations, pocket ponds, and seasonal feeder streams. At approximately 1.5mi/2.4km, the trail begins gaining elevation with views opening up as you switchback up the steep hillside. You’ll crest the ridge through a boulder-ridden forest where the trail for Sunrise Lakes breaks off to the left. Stay right for Clouds Rest and you’ll drop down through the trees to a boulder field below the cliffs of Sunrise Mountain. The trail enters the trees and passes a small pond before gradually working its way up through a varied forest. Stay right at the trail junction as you traverse through a much drier forest. You get a view of the summit before climbing up to the ridgeline. 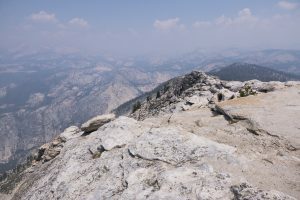 Along the ridge, you look into the sprawling, granite landscape of Tenaya Canyon. The trail meanders up through an open forest before climbing up onto the pancake-layered rocks to the summit. This thrilling section along the exposed ridgeline may challenge those with a fear of heights. 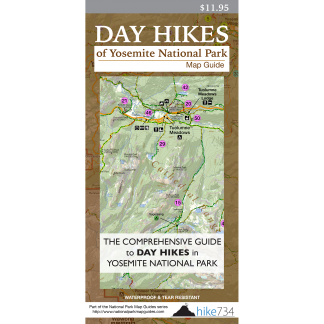 At the top, the breathtaking landscape stretches out in all directions with many incredible landmarks, the most notable is Half Dome along the ridge to the south.